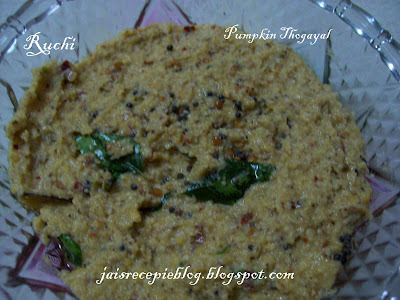 Thuviyal or Thogayal is the Tamil word for ‘chutney’ or spread. Any firm, yellow-fleshed squash/pumpkin can be used for this recipe.I usually makes thogayal with the addition of a vegetable –coconut, corriender, Ridge Gourd,Bringal white pumpkin, chow-chow, etc. 1. Heat 1 tsp oil in a small pan and stir-fry the sliced pumpkin for 2-3 minutes, till the slices start to soften. Remove from the pan and set aside. 2. Heat the second tsp of oil in the same pan and fry the red chillies, channa dal,urad dal and curry leaves till the dal turns golden. Remove the chillies and set aside. 3. Grind the fried chillies, coconut, tamarind, asafoetida powder and pumpkin together, using only as much water as required to make thick but finely ground mixture. 4. When all the ingredients are ground up properly, add the rest of the tempering along with salt to taste and grind for another 20 seconds, so that the dal are shredded but not completely amalgamated. 5. Serve as a side dish with idli, dosa, chapatis, or eat it mixed with ghee and rice with Papad. Thuval in Pumpkin is very innovative. I have not tried surely give a try and let u know. Sounds great, and like you said... with a little ghee and hot rice, heaven! chutney looks so yummy! A very happy new year 2009 to you and your family! Looks simple and delicious. I like thogayal with rice. Also your peas masala is really yum. I don't know why, your feed is not updating in my blog. 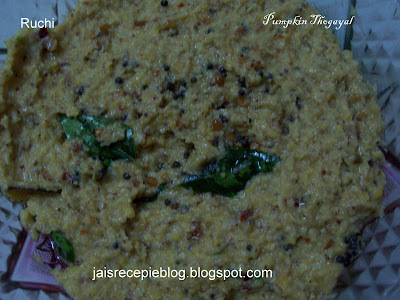 Recently i tried chutney with butternutsquash, pumpkin chutney is in my list already, good to see urs..looks great!! I love all types of thogayal, but never tried with pumpkin sounds delicious....Wish you a very Happy New Year ! Thank u all for your sweet comments& nice to know you all like it. Thank u purva for your information. I will try ..
Wishing you all very Happy and Prosperous New Year!